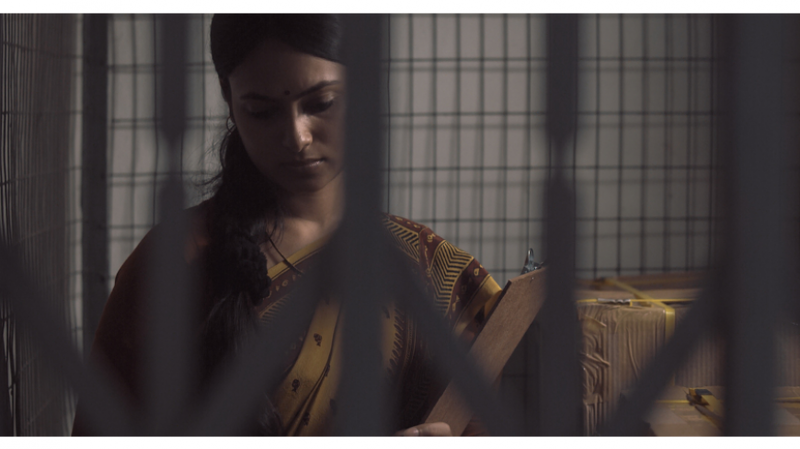 This lyrical and emotionally evocative film revolves around the lives of a couple: a man who works at a newspaper printing press and a woman working at a handbag factory. The partnership of their marriage is conveyed in total silence. The man and woman never speak in the film and neither do we ever come to learn their names. In being nameless or without individual identification, the couple represents millions of men and women caged in industrial civilization. ‘Labors of Love’ opens with a newscaster reporting on a sudden shutdown of a factory due to global recession which results in thousands of workers out of jobs. The screen is black as we hear the news. When the visuals fade in, they do so with music, raga ‘Tilak Kamod’ in Shehnai signifying a wedding. The camera moves over surfaces in close proximity, old rugged walls, examining closely the texture and colour. This is precisely what the film continues to deliver throughout its duration. It examines the textures of the lives of this married couple in excruciating detail. The use of sound and music along with prolonged shots create a unique rhythm to draw the audience into a world without speech. The married couple doesn’t get to see each other as the husband works night shifts while the wife works during the day. However, they carry their partnership seamlessly and in perfect sync. In the beginning of the film we see the woman walking through the alley and then blending into the cacophony that is the crowds of Kolkata. The tired husband comes home, changes into pajamas, washes himself, puts the clothes out for drying that his wife had washed, and eats his rice and fish curry left by his wife. After a small nap, the man is out in the world again, cashing his humble monthly salary check of eight thousand rupee at the bank. He goes to the fish market and buys a fish. At home, he puts the fish in the fridge and goes to bed. While at the handbag factory, enveloped in industrial noise, the wife is seen supervising daily inventory. A beautiful shot in this sequence delivers her caged state as a worker: the shot begins with a serpent like chain holding the old fashioned elevator, as the chain coils the elevator slowly comes up revealing through iron bars the tired face of the woman standing next to huge packaging boxes. The man wakes to the sound of his alarm. He again washes himself, dresses in the clothes left ironed and folded by his wife, takes his food prepared in a tiffin box and leaves the key at a special place for his wife to find. While dressing, he finds a hole in his pants, and so hangs it on the bedpost before leaving. After reaching the empty apartment, the woman changes, washes herself and eats her meal before putting away the kitchen ration her husband had bought from the market. Another meaningful visual strikes when we see the grains: rice, lentil, spices, and mustard being poured into containers. We see the grain in vivid detail, in extreme close ups; we follow its endless falling motion. And it is for these very grains that this man and woman work so hard. It is for this humble meal of rice and curry that they spend literally every waking hour of their days working. What makes the film so special is the attention to details. We witness the daily routine of this man and woman down to the most personal and private details. The struggle for them to fall asleep and wake at an ungodly hour is masterfully done through the portrayal of the body language and facial expression of the actors. By simply looking at the husband and wife sharing identical snacks, tiffin and meals, gives off the impression that they are a couple. They carry out each one of their domestic chores in perfect harmony without having to even verbally communicate. When one comes home, the traces of the other are evident from the burning incense growing small. One picks out the burnt incense and starts a fresh one, continuing the daily ritual in a circular motion. The shot of the man and woman’s wet footprints on the floor is another such element that draw them together. What’s most remarkable is that, the camera lingers on the footprints as they eventually dry up. The camera, still in extreme closeness, also lingers up on the water slowly drying on the frying pan and on the golden mustard oil being poured in its place. The camera takes us very close to the soap bubbles in the bucket where clothes are left to soak, as we hear the popping sound of the bubbles, we are taken into the micro detail and reality of this household. There is no music score done originally for the film. In its place Sengupta uses an array of stock music, the most haunting of which is the use of an old romantic Bengali song ‘Tumi je amar, ogo tumi je amar,’ as the husband is preparing to leave for work while the wife is getting ready to come home. The heightened romanticism of the song is bound to send chills down the Bengali audience’s emotional backbone as the couple continues to miss each other, not just one day, but everyday. The sound design of the film is nothing short of mastery. The macro sound of the monster city: the tram, the mammoth printing machines, packaging machines, the noise of the fish market, the crowd, the newscasters voice, the workers protest on the streets are juxtaposed with the subtle micro sounds of the household: the ceiling fan, the soap bubbles, the girl next door practicing music every morning, the water evaporating on the frying pan, fish frying, floor sweeping. Together these sounds bring the world of this unnamed man and woman alive for us to hear in a cinematic reality devoid of speech. In a world of cinema where the canvas is usually overflowing this kind of stillness is a rare find. Watching ‘Labor of Love’ is nothing short of meditation.